When I was a teenager I had this big dream of going to Australia to learn English; unfortunately, $$ was an issue then and I had to study the language here. Place the white chocolate, milk and vanilla in a heatproof bowl over a saucepan of simmering water, making sure the bowl does not touch the water. Heat until the chocolate is just melted, stirring regularly. Remove from heat and allow to cool for 5 minutes. Add the egg yolks to the chocolate mixture, one at a time, beating well after each addition. Set aside. Whip the cream in a bowl until soft peaks form then fold through the chocolate mixture until just combined. Whisk the egg whites in a large, dry, clean stainless steel bowl until soft peaks form. Using a large metal spoon, fold through the chocolate mixture in two batches. Divide the mousse between six 1 cup (240ml) capacity serving dishes/bowls. Cover and chill for 3 to 4 hours, or until set. Spoon passion fruit on top of the mousse just before serving. I do love a good mouss. I recently tried a lychee one that was a great hint! Thank you for sharing! Sounds great and seems easy! Lovely bowls, are they from Martha? You will love Australia when you go! I am from South Australia/Queensland and it's all beautiful! I now live in Canada which is also wonderful! I love the passion fruit on top! Sounds delicious! Your mousse looks wonderful! Passionfruit is a perfect addition. 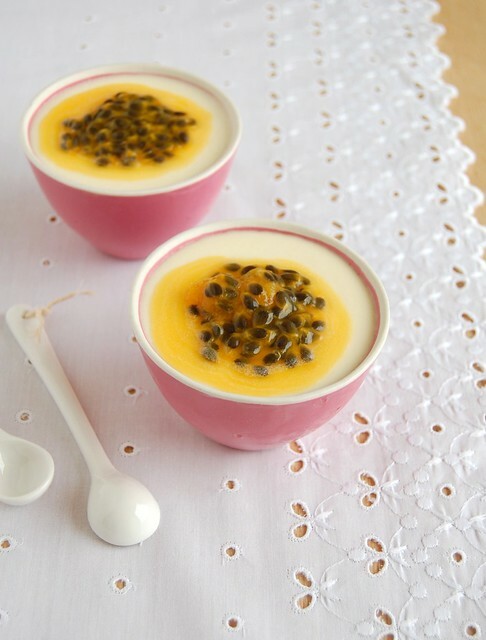 Yum, I love passionfruit mousse! This look delicious and so so pretty! You really can't go wrong with white chocolate or passion fruit anything. Looks tasty! I could eat a dozen, I'm sure. I'm sure you'll be holidaying in Australia before you know it! Also, these look delicious. White chocolate and passionfruit is such a delicious combination. Patricia I am positively turning green with envy because I can't get any (reasonably priced) fresh passionfruit anywhere around where I live (right by the capital of the US!). Gorgeous little pots, my dear. Passion fruit always makes me think of Australia because it was the first place I tried it! These look great! Sil, thank you! These are from an Australian shop called Mozi. Lisa, thank you! Me too! Lisa H., thank you for stopping by! I am sure I'm gonna love it there! This looks totally gorgeous! I love white chocolate with lime, and with passion fruit it must be out of this world. While I'm here, may I have a little whine? Your RSS feed now includes nothing but the title of the post ... and an ad for a dating service. I totally get why you want people to click through, but couldn't you include at least a paragraph of the post? As it is, I very rarely click through to your blog now -- or even look at the feed, because I know it'll have no useful information in it. I like to catch up with feeds when I'm offline, and now it's impossible. Thank you for your comment - I have tried including a bit of the text but without any success. As I don't want the feed to have the complete post, I had to keep it the way it is, now. If you have any tips, I would gladly use them. It seems to suggest you can have a partial feed, either a short excerpt or controlled by where you put the jump break. I don't use Blogger any more, so I'm not sure if these options still apply.